nailhed: Beaver Archipelago, Pt. 3: "Coyote Hungry"
I continued investigating the House of David village. Most of the other cabins here have not fared as well as the first couple I had found however, as I could tell many had suffered fires by the fact that I would be walking through the woods and suddenly find myself surrounded by an accumulation of metal items--the only things that would survive a fire in a wooden house--many of them distorted from extreme heat. These usually included the aforementioned cookware, cast iron stoves, and bedsteads. Whether the fires were set by vandals, by crackhead scrappers, by lightning, or by Viking raiders is unclear. The rest of these metallic survivors I believe remain visible on the surface in defiance of the decades only thanks to the odd passerby such as myself spotting them half buried in leaves or soil, and lifting them up out of the dirt for a better look, cleaning them off for a photo, then setting them back down on top again. If not for the occasional explorer doing this once every couple years, they would have sunk below the surface long ago I think. Mmmm, how many batches of venison stew do you think were whipped up in this bad boy? Trick question--none! The Israelites were friggin' vegans. They prolly made a bunch of onion soup in there. I had probably explored an area several acres in size by now. I lifted it out of the ground and leaned it against the tree for others to find. …undoubtedly a root cellar, or basement. Well it seemed like I had probably found as much as there was to find here, though mysteriously I had not yet seen any sign of Lake Maria, or a trail going there, so I was not sure if I had indeed found all the remains of the Israelite village. I certainly hadn't located the "House of Virgins" yet either, heh. For tonight though I wanted to make sure I had enough time to make it out to the west side of the island to climb the big dune, which would be the most time-consuming activity of my visit. I could finish investigating the village tomorrow morning while waiting for Captain Bonadeo to pick me up. I expected it to take at least an hour to walk to the west shore of the island, so I started off to the trail to ensure that I had enough time to make it back before dark. The trail cut through a sharp dune-shaped berm in the forest floor, and started a gentle ascent that would continue for almost the entire journey to the western side of the island. There are no deer on High Island today, so there is plenty of dense undergrowth and different types of vegetation that would normally be denuded by such herds. There are a few coyotes however, as Jon explained a few inevitably get stranded here every spring when the ice breaks up, and are forced to survive the summer on the island scrounging what they can find, sometimes resorting to cannibalism. He joked that they get pretty hungry and might resort to going after a human if they got the chance, seeing as they would be awfully desperate. He was actually only half joking. "They prolly won't go after ya, but they'll definitely follow you around, and check you out after you leave." It wasn't long before I came to the first of three old reclaimed farm fields that had belonged to the House of David colony. You can identify old farms by the fact that the forest opens up and suddenly you're in a clearing with old fruit trees, and yew or juniper bushes. The frame of an old (1940s?) auto sat overturned at the edge of the field, though it also looked to have a tongue on it, so I don't know if it had been modified into a trailer or what. According to my readings in Ruchhoft's book and the map I had xeroxed out of it, this was the first of three large abandoned fields that I would have to pass through before coming to the dunes. It also meant that I had already passed Lake Maria somewhere to the south of me. From there I was plunged back into a dense, dark cedar grove where the trail started to get extremely faint. I noticed however that someone must have been out here at some point in the very recent past with a hatchet to remove the saplings that were growing up in the path, and to tie little pink ribbons on boughs every so often to mark the trail. Or perhaps it was a government field biologist delineating a wetland boundary? Leaving the cedars and entering a spruce and pine area, I suddenly saw an old farm implement from the 1800s with a large tree growing up out of it! Ruchhoft had mentioned finding one or two farm implements including a McCormick mower, but this was definitely not one of the ones he mentioned seeing. Bonus! I marveled at how old it was and at how big the tree was that had been growing up through its middle, and at how the level of the ground was now up past the hubs of the machine's wheels. This thing had clearly been sitting here for a very long time. Well, at least 90 years to be precise, since the Israelites had abandoned their island commune permanently by 1927. This looked more like a baler or harvester or something…? My city-boy eyes are not expert enough to make a positive ID. The House of David were not the only whites to try to settle High Island; as early as 1850 King James' Strangites came here looking to set up a satellite of the mother kingdom. But this didn't fly too well because unfortunately for the Strangites, by this time the all-Ottawa population of High Island had already been converted to catholicism by the missionaries, and were not keen whatsoever on these Mormon goofballs encroaching on their fisheries, so that was pretty much the end of that idea. The strictly vegetarian Israelites got along with the Ottawa much better, and in fact often traveled to Garden Island in the summer to have picnics, and of course spread their "teachings." I came to the Field #2, which sort of also blends together with Field #3, where I found another archaic farm implement. A hay rake, I believe. There was also supposed to be the ruined frame of a barn just inside the woods at the corner of Field #2, but I never saw it. I also started to find several cairns of fieldstones, piled up on the edges of the field from when it was originally cleared for ploughing by the Israelites over a century ago. This is where I began to lose the trail, and had to reckon my own path. Luckily the way was a constant true-westerly bearing, and I could begin to see the forested backs of the towering dunes looming in the distance. I cut a course in that direction, passing a few more cairns and silent, rusting field machines. It was easy to conjure sepia-toned images in my mind of the faithful standing in a line passing large stones from one set of grubby hands to the next, slowly building these cairns so they could plough and sow. I began to truly understand the feeling of timelessness and romanticism that Ruchhoft described when he hiked this island in 1988 and 1989. This place was a time capsule beyond reckoning. What I was seeing now was exactly identical to what is shown in the tiny black and white photographs he published in his book 23 years prior. Nothing had changed; time had literally stood still here. That was an eerie feeling…I don't think I've ever experienced a more purely literal example of a time capsule than this; it was like I was walking through the pages of the book. One advantage I had over Ruchhoft was that I was here in early spring before leaf-out, whereas he came in summer when dense foliage obscures much of the island's lost relics. As a result I saw many things that he obviously missed, some of them right under his nose. 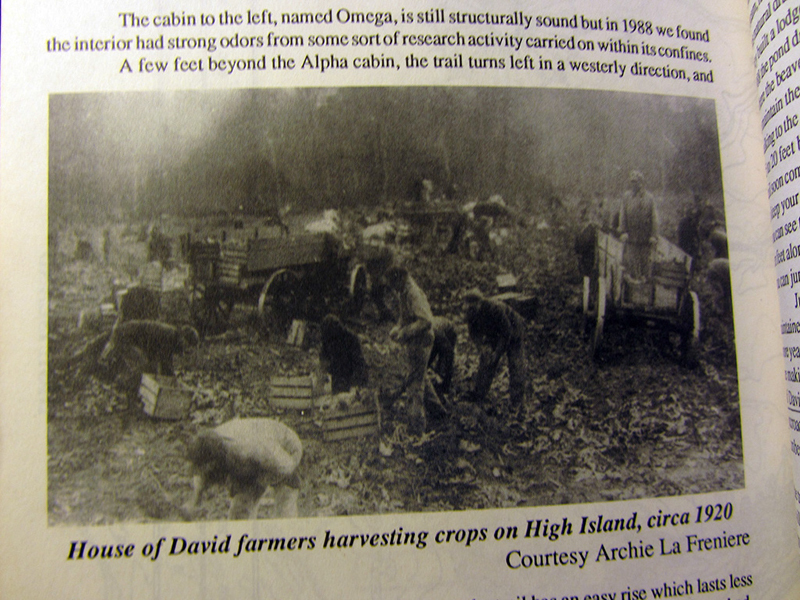 For what it's worth there is another photo book about life on High Island called Island Life, Island Toil: The House of David on High Island, by Ramon Nelson, but it is out of print and expensive. Nelson was one of the last Israelites to leave the island in 1927. I found my way around back of what looked to be the tallest of the dunes, the "Top of the World," and began the incredibly steep ascent on the sandy near-vertical trail. The climb made me huff and puff, but it wasn't long before I reached the top. The 360-degree view is breathtaking, though I must say that I was quite bummed to find the sun had long since retreated behind a drab pall of gray, killing any hope of seeing the spectacular sunset I had come for. When I originally contacted Captain Bonadeo about a trip back in spring of 2010, I had asked him about Gull Island. He does go out there sometimes to take bird researchers (maybe once a year), but because of the extra distance it is very expensive to go there. The island is completely barren and was never inhabited; the only structure is an automated steel lighthouse beacon that was built in the 1940s or '50s and has since been decommissioned. He described both it and the island as unremarkable. Another of High Island's many peculiarities is that despite having had a population, there were never any observable cemeteries. The Ottawa people of course did all their burials on Garden Island, as was tradition. But since the Israelites were not supposed to die--lest it be a sign of sinfulness or omen of weakening faith--it was rumored that the bodies of those who did perish before the "chosen" time were secretly taken at night and interred on the tiny surrounding islands. For this reason, there has been thought that unmarked mass graves may exist on Gull Island or Whiskey Island, which are the closest ones to High Island. The drab sky began to dampen my spirits, so I started back toward camp, deciding to have a small fire tonight while sipping on some whiskey. When I arrived back at "Alpha," I rolled out my bed, dragged a chair over from "Omega," and made a small stick fire to brighten the gloomy evening that was descending upon the island. My mind drifted far as I sat and stared into the kindling oak twigs, clutching my flask until well after dark. This was a new experience for sure. I was the only human being on this entire island. Upon retiring, I closed the door of my cabin tightly, and slid the heavy kitchen table across behind it. Not sure why, but I didn't feel entirely alone. And I didn't want any of those stranded, starving coyotes coming in, heh. When I suddenly jolted awake a few hours later, I told myself that the disturbing sound I had heard was not footsteps in the dry leaves outside the door, and that I should just go back to sleep as quickly as possible before I started thinking about it.